Before deciding where your band should rent a music space, create a checklist, making sure the studio you choose will meet all your needs. All rehearsal studios are not created equal, a better space can definitely help your band have a better session and appear more professional. We’ve created this checklist to help you be prepared for the best possible band or musical rehearsal. This is the most obvious thing you’ll need, in order to rehearse in a studio you will need to be there. Aside from yourself, you’ll want to make sure all your band members are aware of the rehearsal time and date. If you don’t speak with them everyday, be sure to check in a day or two prior to confirm their attendance. Although most members will be creating their own audio first hand, some may choose to have background audio including special effects or old recordings of your music. Making the most our of your band rehearsal involves making a plan. This includes how long you’ll practice for, making a song list and assigning the band members roles. Even though it would probably be fine to just show up to a space and start jamming out, time is money and planning ahead will make be more effective! Technology has afforded many bands the ability to download apps that help enhance their practice and make life much easier. New phone apps like set list allow you display lyrics, communicate with your band members and store your lyrics and chord charts. These apps need wifi or internet in order to work, using a rehearsal studio with wifi will keep you from having to use up all your own internet juice. This will help to deepen the sound and control of the guitars, speakers, microphones and other instruments. All band rehearsal rooms should be equipped with a drum set. Drum sets are not the smallest or lightest of instruments, although bring your own drums is possible it’s just not always practical. Most musicians prefer their own guitar because it’s personal and needs to be fine tuned to your liking. Guitar amps on the other hand are more of a luxury, all rehearsal spaces should have this available and provide easy access for you to plugin right in and get started. Most modern guitar amps are versatile and work well for live, studio and practice performances. These are just some of the key elements we recommend for getting the most out of your studio time. 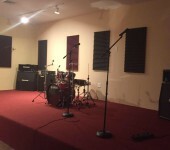 Rapture Sound Studios Syosset, provides some of the most highly equipped rehearsal rooms on Long Island. We’re dedicated to helping your band succeed and this is proven through continuous efforts to provide the best music studio spaces. We have many different rooms and sound systems available, including our brand new sound stage studio. For more information or to book an room contact us here.